Offering complete renovations and custom remodeling, from a small bathroom to master suites, galley kitchen to gourmet "great room" kitchens and room additions. NKBA, BBB and Quality Remodeling top 500. Awards and Certifications displayed at showrooms, along with publications of our work in several magazines. I was very impressed with Kitchen’s Plus. We wanted to redo the entire kitchen and did not know where to start. We checked out several companies. We were impressed the most by Kitchen’s Plus. It started with Dennis, who had ideas for our kitchen that we didn’t even consider. He drew up about 5 different layouts, more than any other company we went too. Matt and his team were the best. Matt was very good with letting me know the progress of the work and would answer any questions we had or address any concerns we had during the projects. It was our first remodel of our home and we were somewhat new to the idea of having someone in our home when we were not there. It passed very quickly. This is a very trustworthy company. We have a chocolate lab who was very excited to see them every day. They let him out and I am sure gave him treats. 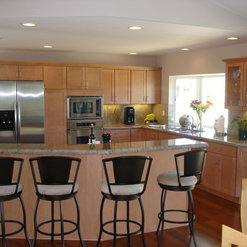 The job was very well done and we were so pleased with the kitchen, that we hired them to do both our bathrooms. During the remodel, I would ask if they could do other things, like get rid of popcorn ceilings, remove all the doors, and replace with new doors, etc. They gave me a quick quote and extras were done along with the main job. I would highly recommend this company to anyone who wants a job done well with people who you can trust to be in your home. Shout out to Aksel who was amazing during all 3 remodels. Thanks for sharing your experience and the wonderful review! We enjoyed working on your project and the fact that each bathroom was unique in theme and that you had a vision you wanted to achieve for each space ... mission accomplished! The crew really appreciated your hospitality and even mention Lisa's amazing brownies to this day - you spoiled them! haha! We are very pleased with our kitchen remodel and powder room addition. 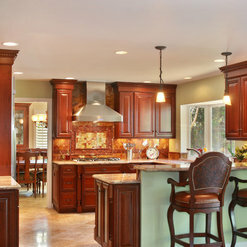 Kitchens Plus is very detail oriented and uses quality material. They are truly dedicated to providing quality service and we very much enjoyed working with them. Kitchens Plus did an amazing job. 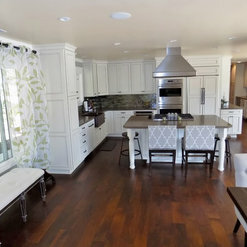 Our remodel was creative, functional and truly spectacular. The crew was professional and friendly. 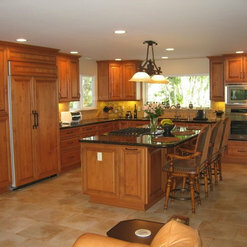 We used Kitchens Plus a few years ago to do an addition on our home as well as a complete Kitchen remodel. This job was huge and done in two phases. The addition doubled the size of our home and was two stories. It included a full master suite and Mother-in-laws apartment that had a kitchen and was fully handicap compliant. The second phase was a remodel of our "old" house kitchen, all new floors, windows, new roof, new stucco, and some carpet. The quality of the work was top notch. The price very competitive. The communication was easy. The design was perfect. The workers were there every day and pleasant to be around. There were no delays and maybe the most important part now is that years later if something comes up, Matt and his team are 100% responsive in communicating and even driving up to our home the following day to address what seemed to be a leak. The very next day! Not long ago I wanted to find some touch-up paint for the kitchen cabinets and they were very helpful and followed up to make sure the issue was resolved. I can not recommend them more. I am happy to be a personal reference if anyone wanted to talk with me or see photos of the work. Thank you for sharing your experience with Kitchens Plus (and the photos!) and the kind words - we really appreciate it! You and your family were a pleasure to work for! You project still remains as one of the largest (doubling the size of a home) remodels we have completed and we are very proud of the design and work completed. We love hearing that you are enjoying the added space and new design. Thank you for the continued referrals you send our way too, truly appreciated! 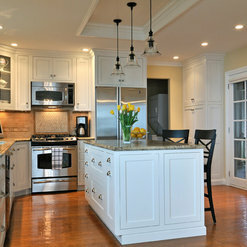 Kitchens Plus did an incredible job from beginning to end with our kitchen remodel, what a transformation!! We have already referred them to two other friends and family and they have done an incredible job. True professionals! Thank you for sharing your kind words and the referrals, we really appreciate it! Word of mouth and referrals is the staple for our business and we love having a showcase project such as yours for people to see! You both were an absolute pleasure to work for. We hope you enjoy the kitchen for many, many years to come. Let us know if you need anything in the future. 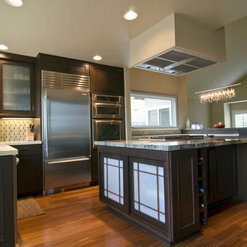 After checking into several remodelers around town, Kitchens Plus came out as our top choice. The whole process, as well as the results of our kitchen and bath remodel just confirmed we made the right decision. Matt Barns and his staff were excellent in all aspects of the project. They adhered to the time line and kept us informed of the schedule. They were attentive to details big and small, and provided effective solutions to anything that came up from the original construction. Jim Peterman and Stefanie Zanow really helped to finalize all the layout and design aspects. To sum it all up, this was the most positive experience we could have hoped for, with exceptional quality and craftsmanship at a price that was better than most other remodelers we looked into. Thank you for the 5 star review and kind words. You both were a pleasure to work for and the project looks amazing ... great selection/choices in materials and colors! 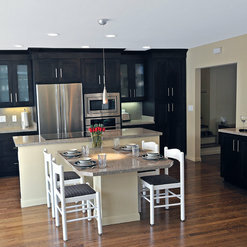 We hope you enjoy many, many years of entertaining and cooking in your new kitchen! 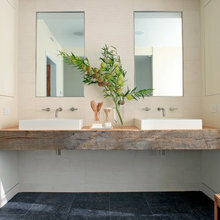 This is the company to go with for kitchen or bathroom remodels. 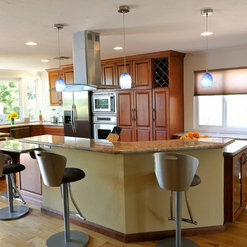 My first remodel was a kitchen in 1994 when Matt, the owner, was just starting out in sales. My second was another kitchen remodel after I moved and bought a condo in 2005. My third and fourth were my master bath and guest bath a year ago. Kitchens Plus did a fantastic job. 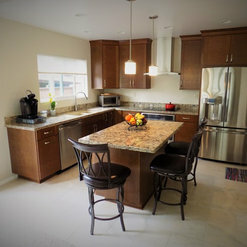 They were knowledgable in every aspect of the remodels and their quality of workmanship is outstanding. They worked with my budget and personal time schedule and completed the projects when promised. All workers were polite and courteous and cleaned up daily at the end of the day. Please-----at least call them for a quote on your next project. Your won't regret it. Thank you Judy, I really appreciate you taking the time to share your experiences with Kitchens Plus. The best compliment we can receive is when a client returns again and again for new projects. Amazing that your first project/kitchen was done 23 years ago! We appreciate the referral business that you have sent through the years as well ... that's what has kept us going strong for 30 years - we really appreciate it! We worked with Kitchens Plus, La Mesa, CA on the remodeling of our kitchen in 2013 and now on the addition of a powder room. They are extremely professional and detail oriented from design to completion. They use the highest quality materials and provide the best service that we have ever experienced. Hi Connie and thank you for the kind words! We strive to make every client happy and provide quick and cost effective service ... and that's a tough thing to balance! :) Our crews respect your home and I'm glad to hear you have experienced that professionalism. 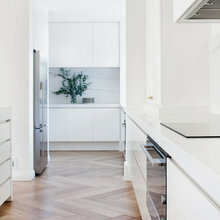 Your kitchen is one of topic frequently ... just beautiful!! Thank you for your return business ... that's is important to our business success and tells us we are doing things the right way! 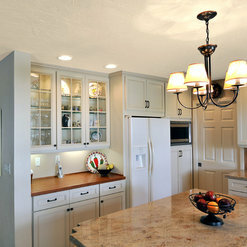 Kitchens Plus finished our concurrent kitchen and bath remodels in late August last year. So why nearly five months to write a review? We wanted to live with our beautiful new kitchen and bath for awhile to be sure the new functionality and usability would prove itself on a daily basis. Well, I can tell you that thanks to owner Matt Barns and his Kitchens Plus staff our satisfaction is complete. 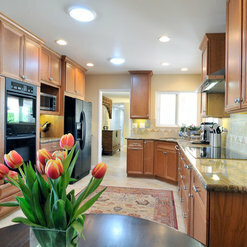 The effectiveness of our kitchen design proves itself day in and day out. Mike and Loretto were the guys doing the majority of the work and I commend their workmanship. Mike was the lead man and his particular attention to detail certainly resulted in a better job. They were always on time, patient when we interrupted with questions, and cleaned up every day. My wife and I were rather particular on a number of things but Matt never blinked. He delivered on his commitment to resolve any concern we had. He stated that he believes "there are no problems; only challenges." Good attitude. He came by almost every day and always made us feel like he had nothing but time for us. He returned phone calls within a reasonable period of time. Any contractor is only as good as his or her last job and Matt Barns understands this. We will not hesitate to use them again. Call their La Mesa office and ask for pictures. Ours was not a particularly large job; but then job size doesn't matter when it comes to customer satisfaction. 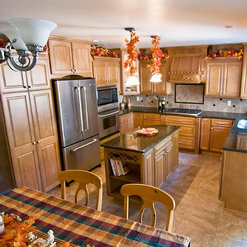 Kitchens Plus did an excellent job for us; I'm sure they will for you, too. Thank you for taking the time to write such a great review! I appreciate you recognizing the crew by name as most of them have been with us for over 20- 25 years now. Our crews pride themselves on detail and taking the time to get it right and it's nice to hear you also see and appreciate that quality and effort. We always try to figure that if "it's important enough for you to mention ... then it has to be important for us to take care of"! You have a beautiful home and I wish you and Debbie many, many years of enjoyment in your new kitchen and bathroom. Thanks again for the kind words and glowing review - very much appreciated! Kitchens Plus has done an incredible job making our house a home. Over the years, they have remodeled our kitchen, remodeled three bathrooms, built a room addition and put on a front patio. After the first job, they won our business for life. The quality is top notch and the crew was very enjoyable to work with. They kept everything clean and neat and were extremely nice and professional. Every project was done on time and within the budget. 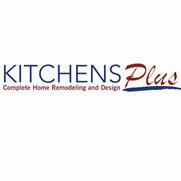 There are many contractors to choose from, but Matt Barns and his team at Kitchens Plus represent a level of ethics and attention to detail that can't be matched. Go with Kitchens Plus, you will be glad you did! Thank you so much for the kinds words and a stellar review! The biggest compliment we can receive is when a client comes back to us again and again for another project ... and you returned for 5 different projects! You both were a pleasure to work for and I really appreciate the referrals you have sent our way as well. Thank you again for your continued business, very much appreciated! Thanks again for your business, always appreciated! Commented: ShowerGlass blocks are very outdated. I would opt to do a decorative curtain or even a single glass panel instead of a full door. 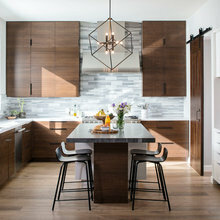 Commented: Need advice on backsplash.Stick with a white beveled 3x6 subway tile. The bevel gives it a great look instead of just the smooth standard subway.